The manufacturing sector has fundamental to the economy of North Carolina and the Mountain Resources Commission (MRC) region, in particular. 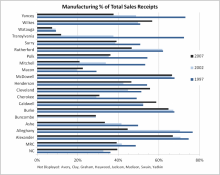 In 1997, the value of sales, shipments, and receipts from manufacturing represented 48 percent of the MRC region’s total, compared with only 36 percent of the state’s total, and the sector employed about 44 percent of the region’s workforce, compared with only 26 percent of the state’s workforce. Domestic manufacturing has been in declining over the past decade, however. 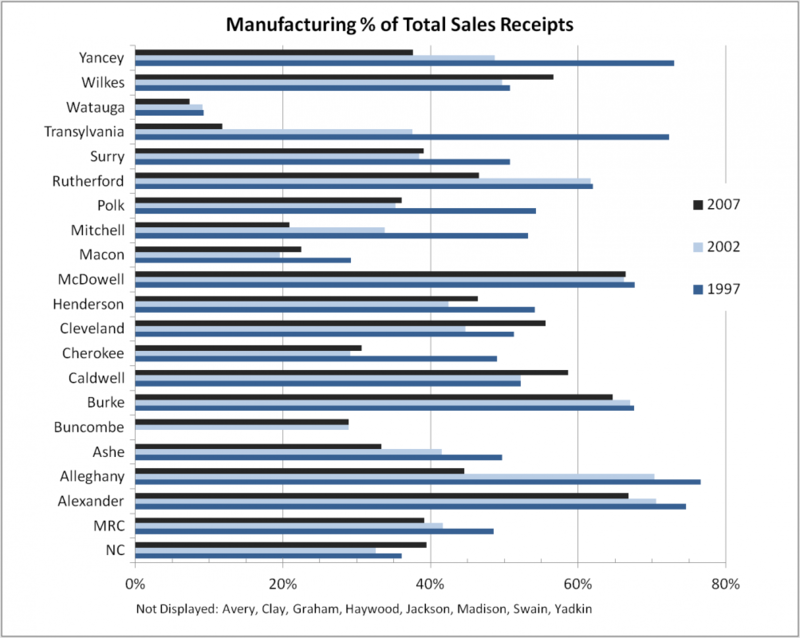 By 2007, only 16 percent of the state’s workforce and 25 percent of the MRC region’s workforce were employed in manufacturing, and the value of sales from the sector declined to $18 billion – only 39 percent of the MRC region’s total sales value. Between 1997 and 2007, manufacturing sales in the MRC region increased 1.2 percent, while total sales increased more than 25 percent. Manufacturing’s importance as a source of jobs has decreased substantially throughout the MRC region over the past decade. Employment in the manufacturing sector represented more than 50 percent of the jobs in 14 of the MRC region’s 27 counties in 1997, but by 2007 employment in the manufacturing sector represented at least half the jobs in only two counties – Alexander (59 percent) and McDowell (55 percent). Transylvania County lost nearly five out of every six manufacturing sector jobs during the decade from 1997-2007, while Mitchell County lost more than two out of every three manufacturing sector jobs over the same period. McDowell County is particularly notable as the only county in the MRC region to have gained manufacturing sector jobs between 1997 and 2007, adding 438 manufacturing jobs, or 7.2 percent. Despite overall state- and region-wide declines in the manufacturing sector, manufacturing sector activity is not all negative. Comparing the change in manufacturing establishments (births/deaths) to the change in total establishments identifies the counties in which growth in manufacturing establishments is outpacing overall establishment growth. As shown in the map, manufacturing establishment growth outpaced overall establishment growth in eight of the region’s 27 counties, and the rate of change in manufacturing establishment growth outpaced the statewide rate in 14 of the region’s counties in 2008.